Don’t just hide your pain when you can disguise your pain. 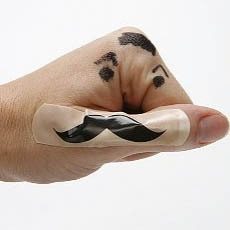 Mustache bandages help cure your pain with a silly graphic that will make you smile. A tin contains 25 mustaches that you’re obligated to draw silly faces around once stuck on your skin. I guess there is a market for these.